The life of a student is extremely busy, you balance classes, homework, extra-curricular activities, and some projects in your daily routine. As a student, I felt the same in my early college days. 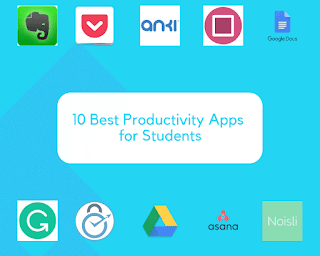 I did some research to find out something that helps me out to reduce time-consuming in performing tasks and eventually I got to know about these 10 best productivity apps for students. I used some of these apps to build a routine in my daily life. Productivity means achieving goals and making the most of your time. Productivity tools let you work smarter and efficiently by reducing time-consuming in performing tasks such as creating documents, presentations, worksheets, databases graphs, etc. Installing these tools on your smartphone or desktop can make your student life a little bit easier. Evernote is considered as one of the best note-taking applications available. It is used to create "notes," which could be text, photographs, videos, PDFs, record voice messages stored in its cloud service. You can create stacks of notebooks and tag notes to organize them into categories. You can keep records and manage projects from any device even if you`re offline. Evernote alternative is OneNote, which is also a note-taking app from Microsoft. Pocket, previously known as Read it later is an interesting application used to save web pages, articles, and videos for later reading or viewing. The application was originally intended only for PCs but later it was made available for Android, iOS, MacOS, and Blackberry. It can also sync files across all your devices at once. You can also use it to save articles and web pages for offline reading. Anki is a productivity app that lets you create digital flashcards that are easier to remember than traditional flashcards. Anki uses an open-sourced Space Repetition system which assesses how well you remembered each flashcard and figures out when you need to review it again. Anki offers smartphone apps available for Android, Windows, iOS so you can review your cards from anywhere. PomoDone App uses the Pomodoro technique to keep track of the time you spend on your tasks. The technique has 2 steps: you work for 25 minutes and then take a 5-minute break. PomoDone is a countdown clock with customization options such as changing the default time settings and automatically starting new sessions. This helps in staying focussed for long durations of time. Google Docs is an online app for creating and editing documents, presentations, and spreadsheets. You can also use it to take notes offline and have Google sync them with your account once you're connected with the internet. It is fully collaborative, meaning two or more people can edit the same file at once. Grammarly is an online grammar checking app that automatically detects grammar, spelling, punctuation, word choice, plagiarism checker, and style mistakes in writing. Grammarly is available as an app for both iOS, Android and it is also available via a browser extension for Google Chrome, Firefox and Safari. FocusMe is an app that blocks your access to certain websites and time-sucking apps for a set period of time. It is available for Windows, Android, and iOS users. You need to list apps, sites that you need to block, after that it will restrict your access to these apps, sites. It helps in developing a schedule for your workday that ensures you get the important stuff done. It improves your productivity by Limiting your time daily or hourly on any website or app and helps to save time. I think it is one of the best productivity apps for students. Google Drive is an online cloud storage based platform where you can store all of your files. Google Drive gives you first 15GB of your storage free with your Gmail account. You can access all your files from any smartphone, tablet or PC and can quickly invite others to view, download, and collaborate on the files you want. Asana is a free project management application designed to help teams organize, track, and manage their work. You create different projects, add people to those projects, then create tasks and assign to anyone who needs to get them done. You can also add sub-tasks with-in your tasks, have conversations, share files, and set completion dates. Asana lets you do email, task management, and file sharing with-in one platform. Noisli is an app that generates background sounds to swap distracting noise and sharpen your focus. It creates mix gentle sounds that can be run on a continuous loop and combined to create soothing, ambient noise. You can create a mix of the chirp of forest birds with a gently falling rain. There are various other sound effects like Rain, thunderstorm, wind, forest and many more. It is available for Windows, Android, and iOS users. You can also download a Noisli browser extension for PC. We hope these 10 best productivity apps for students will help you in your student life. Remember, Focus on being Productive instead of Busy. Be sure to Subscribe us to stay up to date with our blog for more helpful advice such as choosing the best strategy games to improve brain power.